>>>This is a multi-unit set. South and North Korea are on the verge of reunification, and the best way to celebrate this momentous occasion is the re-opening of the Gyunghuiseon Line. But Japan, claiming ownership of the line, interrupts the festivities with a contract signed by the last Joseon Emperor, Gojong, a move which drives both Koreas into a crisis. No man has influenced Korean commercial cinema in the last decade like Director Kang Woo Suk. When he formed a small film company in 1993, nobody expected Cinema Service to become one of the most important names in Chungmuro. But Kang is not simply a mega-producer, he's also a talented director with a knack for finding the right theme at the right time. With Two Cops in 1993 he brought commercial filmmaking back from the abyss of the early 90s, and then in 2003, a little film called Silmido became the first ever Korean production to sell more than 10 million tickets. Kang's new film Hanbando follows the same path as his previous films: it's very controversial and it's a big spectacle. 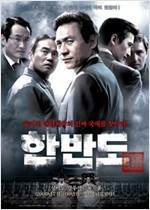 The huge cast is highlighted with experienced actors, including Ahn Sung Ki (Musa, Duelist) as the Korean President, Moon Sung Keun (Princess Aurora) as the skeptical Prime Minister, and finally Cha In Pyo (Hong Kong Express) and Cho Jae Hyun (Bad Guy, Piano) as the agents trying to get to the truth. The 10 billion won blockbuster Hanbando polarized viewers because of its strong political themes, and drew close to 4 million people to the theaters. Now is your chance to see what caused all that fuss.